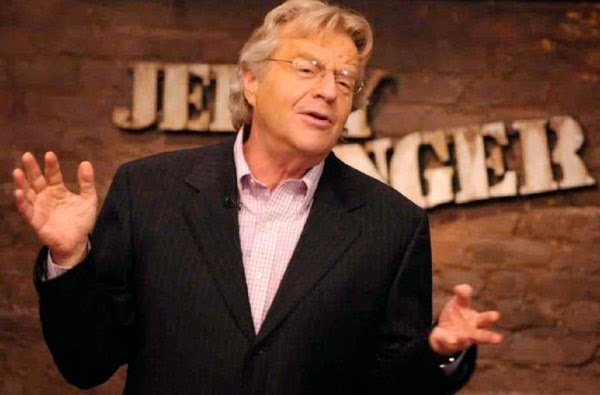 Jerry Springer is British-American host of "The Jerry Springer Show," a violent, confrontational, infamous television talk show. He was also journalist, lawyer and politician... Read his short biography below. After graduating from law school, he worked as an aide to Robert F. Kennedy but joined a Cincinnati law firm after his boss was assassinated. In the 1970s, Springer was elected to local government, serving as a city councilman until a scandal forced him to resign in 1974. (He patronized a prostitute and was caught because he paid for her services by check!) But a few years later, he spun his illegal activities into a campaign platform of honesty, was reelected councilman and later served as the city's mayor. During the 1980s, he traded politics for journalism, becoming a popular newscaster and radio personality. In 1991, he went national with the syndicated Jerry Springer Show. Although it started out as a subdued, serious Donahue clone, the host spiced things up in order to improve the ratings and he ended up becoming an international entertainment icon simply by sitting back and letting his guests behave badly. No matter how violent or outrageous the episode, he always closed the show with his incongruous catchphrase, "Take care of yourself, and each other." Springer's fame led to a plethora of TV and film cameos, a starring turn in the thinly veiled autobiographical 1998 film Ringmaster and a country album. A ubiquitous pop-culture punch line---there's even an opera named after him---Springer has a more serious side as a high-profile Democratic fund-raiser, activist and political commentator. In 2006, the so-called Sultan of Salaciousness melted viewers' hearts when he signed on to Dancing with the Stars so he could learn to waltz for his physically challenged daughter's wedding. He took his dancing shoes to the stage in 2009, playing Billy Flynn in the musical "Chicago" in London and on Broadway. Parents fled Nazi Germany in 1939, moving to London. First job out of law school was as a campaign aide to Sen. Robert F. Kennedy in 1968. Elected mayor of Cincinnati in 1977 by the largest plurality in the 20th century of that city's history. Won seven local Emmys for his commentaries on Cincinnati's WLWT-TV. Recorded a country album in 1995 called Dr. Talk. Popular on the speaking circuit, the Northwestern Law School grad was the controversial choice as the law school's 2008 commencement speaker. Lawyer Biography: Carlo Pedersoli or "Bud Spencer"
5 Famous US Court Cases Of 2013. All content provided on this blog is for informational purposes only. This blog does not offer legal advice. If you need legal advice, consult with a lawyer instead of a blog.